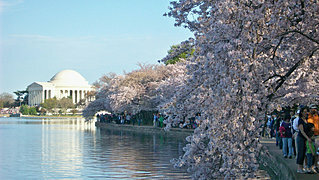 The year 2012 marks the centennial anniversary of the gift of the cherry blossom trees from Japan to the United States. The cherry blossom trees, including some of the original ones from 1912, bloom beautifully every spring at the Tidal Basin along the Potomac River in Washington D.C. Various events are held during that season with the cooperation of numerous individuals and organizations from both countries, and more than a million people visit Washington D.C. every year from around the United States and around the world to see and cherish the cherry blossoms in full bloom. Over the years, the cherry blossom trees have encouraged exchanges between the two nations as well as contributed to a deeper understanding of Japan. A series of events celebrating this centennial are being organized to promote cultural and people-to-people exchanges, thereby strengthening one of the main pillars of the Japan-U.S. alliance. Through these events, people from Japan and the United States will have the opportunity to reflect on the legacy of exchanges and the importance of relations between the two countries. This initiative will also lay a solid foundation for another of 100 years of Japan-U.S. friendship. The gift of cherry blossom trees to the U.S. was made possible by the contribution of many people, including then U.S. First Lady Helen Taft, journalist and world traveler Eliza Scidmore, the renowned Japanese chemist Dr. Jokichi Takamine, famous for his pioneering research on Adrenaline and Takadiastase, and Tokyo Mayor Yukio Ozaki. In 1909, Mayor Ozaki made a gift of 2,000 cherry blossom trees to Washington D.C. as a token of friendship between Japan and the United States. However, all of those trees had to be destroyed because they were found to be infested with harmful insects. In 1912, another 3,000 cherry blossom trees were presented to the United States, and the first of these were planted at the Tidal Basin by First Lady Taft and Viscountess Chinda, wife of the Japanese Ambassador Chinda, in a ceremony on March 27, 1912. Many other individuals and organizations dedicated to deepening the ties of friendship between Japan and the United States played a part in the presentation of this historic gift. The Japan-U.S. Cherry Blossom Centennial logo was designed by National Cherry Blossom Festival Inc., which supports Japan-U.S. friendship by hosting the annual National Cherry Blossom Festival in Washington D.C. The cherry blossom trees are today a symbol of the friendship and many exchanges between the two countries. Events related to the Japan-U.S. Cherry Blossom Centennial will be held mainly in Washington D.C. Please check the following websites for further details. National Cherry Blossom Festival Inc.